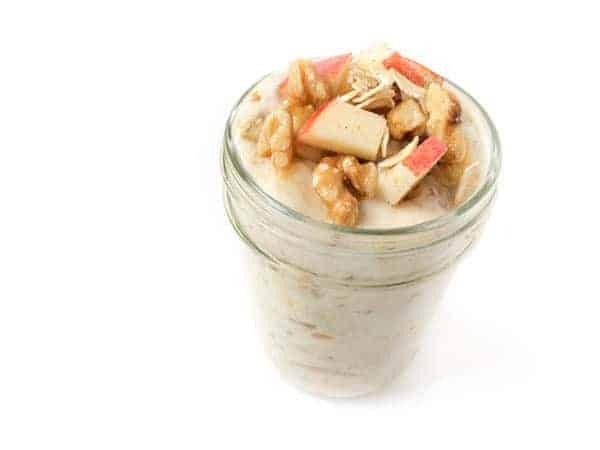 This Overnight No Cook Apple Pie Oatmeal is everything you love about fall turned into a healthy, make-ahead breakfast. October is such a fun and BUSY month – I love every second of it. But I have to admit – I’m still trying to get in the groove with back to school. Heck, it’s not even *back* to school for us since this is our very first year ever having to set an alarm clock or be on any sort of set schedule. I would be lying if I said the morning wasn’t always bit hectic in our house. One thing I’ve been trying to do a better job of is prepping breakfast ahead of time. I’m pretty good at having a dinner plan and I usually eat leftovers for lunch but I don’t always remember to have a plan for breakfast. This is where overnight refrigerator oats come into play as they literally take just minutes to prepare and you wake up to breakfast waiting for you. 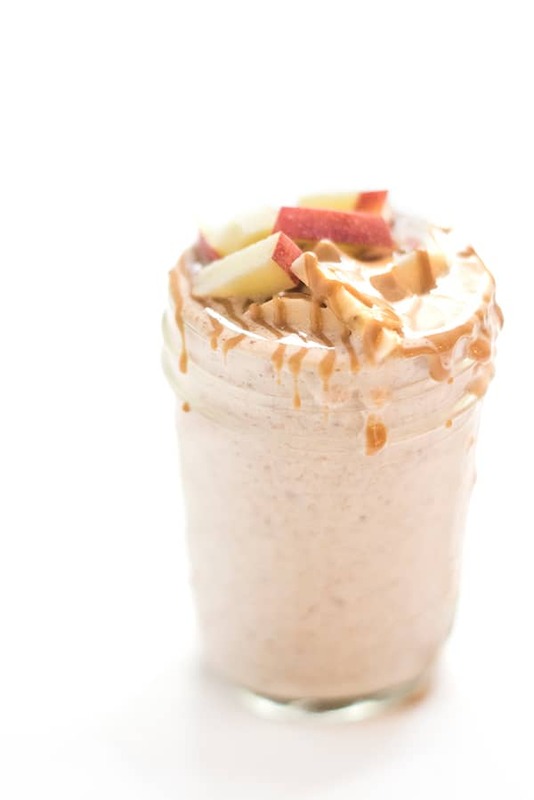 I’ve made them before with blueberries as well as with steel cut oats but this time I decided to turn America’s favorite apple pie into a healthy, protein-packed breakfast. The best part? You can assemble a big batch of these at once and they will last in the fridge for up to 4 days. 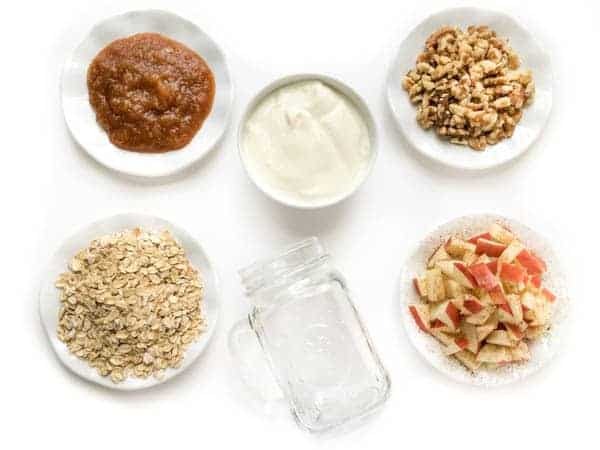 If you don’t have resealable mason jars, just whip up the oats in a large bowl and scoop them out each morning in your usual cereal bowl. Feel free to top them with extra diced apples, chopped walnuts and ground cinnamon in the morning. You can never have too much cinnamon in my book. 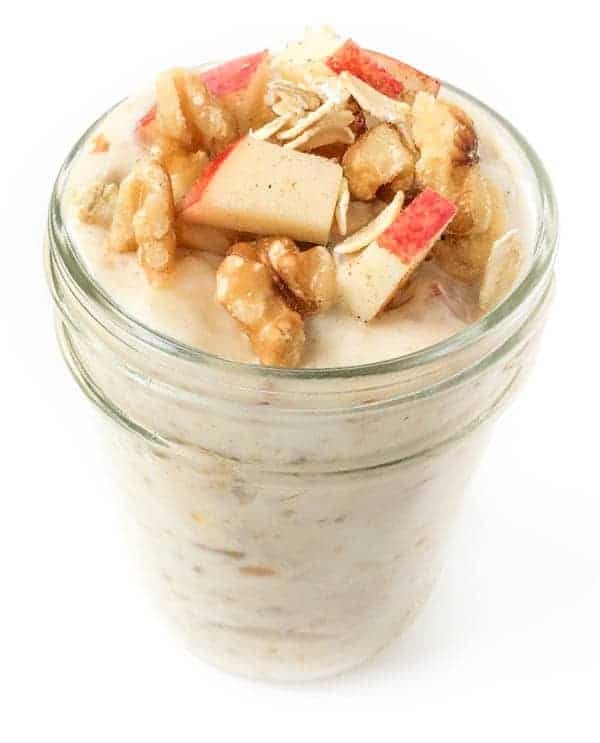 Apple Pie Refrigerator Oatmeal is everything you love about fall turned into a healthy, make-ahead breakfast. In a large bowl stir together all ingredients: oats through walnuts. Cover bowl with plastic wrap or seal jar with lid and refrigerate overnight. Serve in small bowls chilled or at room temperature the next day. Garnish with additional chopped walnuts or diced apples if you wish. Oats can be prepared up to 4 days in advance - great for planning ahead for a busy week. 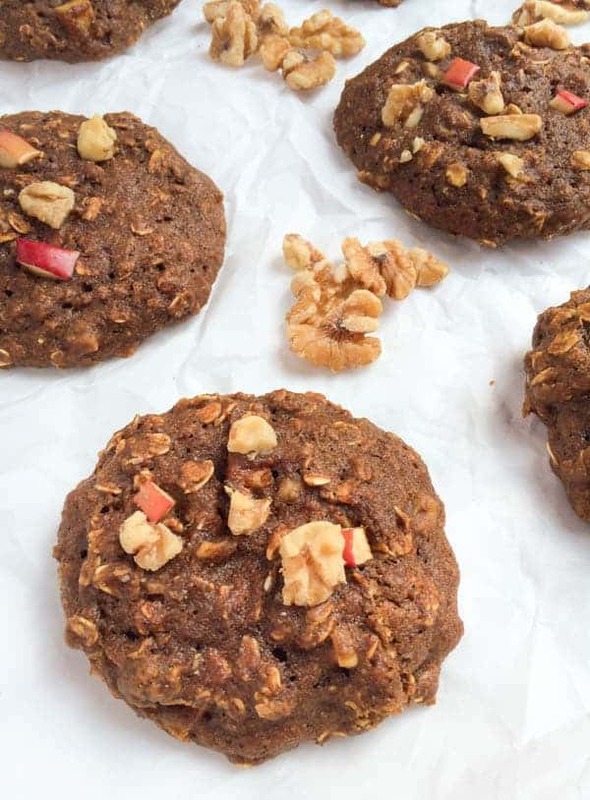 Head over to my Pinterest page for more Healthy Breakfast Ideas! I’m always running around in the mornings like a mad woman and never have time to plan out breakfast. Love that these keep for 4 days in the fridge, perfect! I love refrigerator oatmeal… and Musselman’s… and easy breakfast ideas. Basically I LOVE this recipe! I hope you love it Liv!! I want this for my next breakfast!! Seriously girl! Wish I could eat it with you! Miss you! I love doing easy make ahead breakfasts like this. We do a lot of refrigerator oats around here! I like the idea of using apple butter–I have to give that a try! It was so good and too perfect for this time of year! Yes the apple butter is full of spices – plus you can always add more cinnamon or even throw in nutmeg, cloves, etc. Yummy!! This looks so good! I absolutely LOVE this idea! Going to give it a try with my Musselman’s Apple Butter and get my whole family eating a quick, healthy breakfast! I bet your boys would devour this Nikki!! It was so fun apple picking with you all last week! haha it sure is girlfriend!! Come eat with me! I love that apple butter! I must try making overnight oats more often. Better than just grabbing unhealthy cereal! I am always so glad I thought to do it when I wake up in the morning! Oh, I love this. 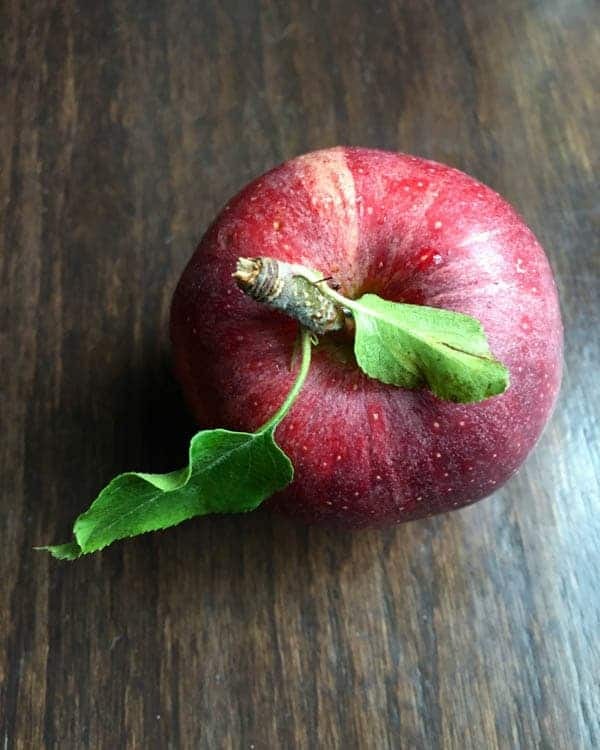 My kids are all about the apples and the oatmeal, so this will be perfect for breakfast! 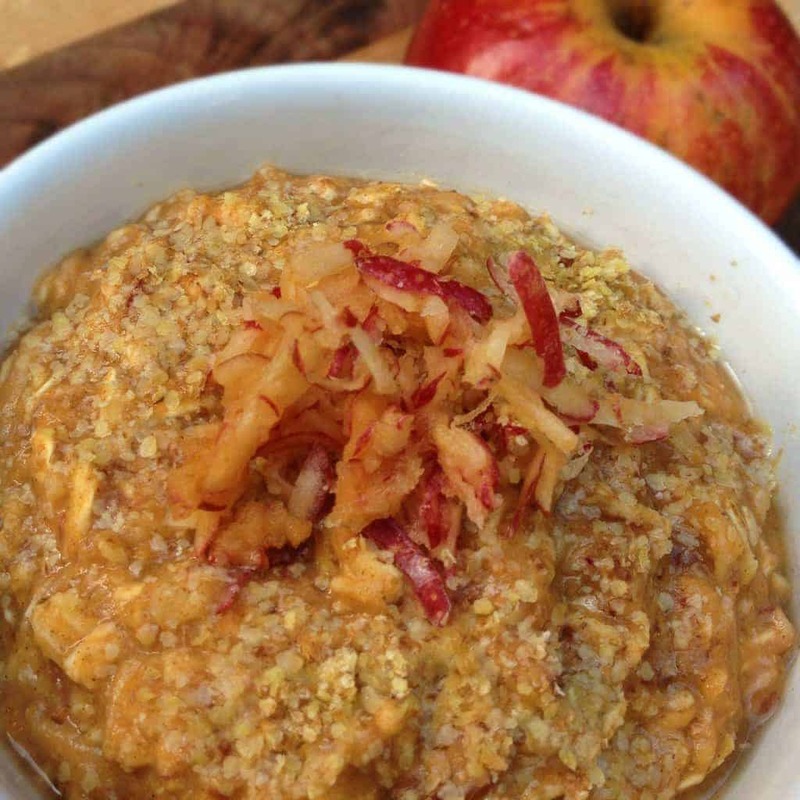 There is just nothing better than apples and oatmeal! I LOVE Musselman’s apple butter….and what a delicious, easy recipe to make with it! This looks fabulous! Isn’t it the best? Thank you! Such a perfect, comforting, seasonal overnight oats variation!